Happy new year to you all! I hope you all have a wonderful year, filled with love and joy and laughter and friendship, good food and wonderful experiences. As soon as I narrow them down, I’ll let you know about it! In the mean time, welcome to 2009! And now to the Confession. I went and did it. 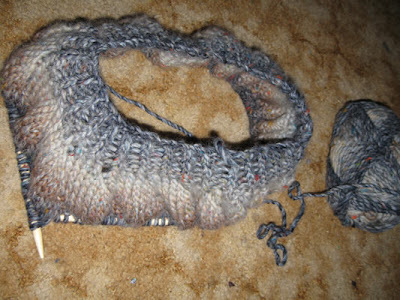 I started knitting a clothing item. And for a loved one. I have a feeling I’ve opened the floodgates now! The only clothing I’ve ever knitted is a vest based on one of the creatures from Where The Wild Things Are. I worked on the film for 5 months and when it ended, I found myself housesitting for a friend and having a week off, my head was still filled with the Wild Things, so I knitted myself a vest of my favourite one, Carol. You can see a couple of screenshots of a test shoot which features Carol here. Anyway, it took me all week solidly knitting and I vowed that, even though I loved Carol and the vest, that knitting clothing was too much for me. At the left is the vest, obviously 🙂 Forgive the photo quality, it was a shot from my phone a few years ago. It was a pretty easy knit, two large rectangles of brown and tan stripes with some ribbing down the bottom, one with some short rows in it to make the split, and two rectangles of furry yarn with a rounded corner for the hood. It made me happy that I found it so easy to figure out patterns for stuff. But so I vowed off knitting clothing, I am an impatient woman, and I like stuff to be over fast, and a week was too long. So knitting and sewing small things like dolls makes me happy, you get to see the results pretty quickly and can be off onto the next one. But now, after a couple of years knitting (the vest was about the first thing I knitted in my adult life, which was around 2006 I think) I have broken that vow. I’m currently a day into knitting a beanie for Jude. Being a tall man (with a matching head :), he can never find beanies that fit him, so I offered to knit him one. He’s been keen on me knitting a jumper for him for a while now, but I figured a beanie was a better idea, dipping my toes in the water rather than jumping in the deep end. So we discussed beanies and he wants a sort of 90s grunge one. Pretty simple, it’s jsut a big floppy beanie, almost like the kind people wear with dreads. My idea was some ribbing, then increase for a while, then just plain knitting for a while, then close back in. This is it so far, after a day of knitting. The almost cabled effect was due to a new kind of increase, for me at least. During the Turkish Ladies Knitting workshops, one of the ladies showed me the Yarn Over style of increase, and I was hooked. I love the look of it. So this cabling effect (which I didn’t expect but am very pleased with) is a Yarn Over one stitch to the left of each previous YO. I started by doing a YO every 4 stitches but as it’s an increase it quickly became every 5, then every 6 ect. Now that I’ve done enough increases (and that I’ve run out of room on the circular needles) I’m no longer increasing, but to continue the pattern I’m doing a purl stitch to the left of each previous one. When I start decreasing, I’ll decrease to the left of each previous decrease, and I’m hoping that’ll continue the spiralling pattern in. It’s an advenutre! The best bit about this beanie, which may turn out to be the worst thing, is that I’m now all keen to start knitting cardigans, jumpers and other types of clothing… It’s a really exciting avenue that’s opened up, but I’m worried it’ll drive me crazy with the amount of time it’ll take! …oh i know just what you mean…but at least it’s only a beanie…but that vest was wonderful….. I finished the beanie yesterday and I’m all geared up for the next project, maybe a cardigan for me. It’s going to take a while, but I’m all enthusastic now!